Christmas arrived with clearing skies and a day full of sunshine! We had been running the generator on and off the past 4 days due to lack of solar power so the sun was a welcome sight. Christmas is a time that most people get together with friends and family and the ever dreaded…. Christmas Drama… crying kids, in-laws or families that just cannot get along, everyone has experienced it. You would think we would be exempt from drama, after all it was just the 4 of us out in the middle of the desert…..Wrong! When you have a 2 year old lab, they think the world revolves around them so when we laid out Daisy and Dakota’s stockings filled with dog treats and toys Dakota wanted it all. Once all the gifts were unwrapped Dakota decided that she did not want to share becoming very possessive taking each of the toys one by one into the back corner of her crate and laying in there protecting them! After all the antagonizing about it for several weeks I got Barb an Instant Pot! (Hey, that is what she asked for) So we are now part of the Instant Pot Club, I think we were the last members for many of our friends who got one in the last year and absolutely love them! Barb got me a training collar, I am still uncertain if it is really for me or for Dakota. After 31 years you would think she would know better than try to teach me new tricks. The day after Christmas we had our first visitor! Our friend Kevin from Wisconsin was in Phoenix visiting his parents for Christmas and drove out to spend a couple days with us. We went jeeping the first afternoon heading out in the desert just west of the airport. I had a general idea of where we were heading hoping to come out on the Marble Mine Rd. After 3 hours we were still jeeping along with no road in sight. When a group of 4 wheelers approached us from the opposite direction we stopped and asked them if we were on the right track. “Yup just take the next right and it will wind towards the mine”. Perfect, we were ready to get out of the desert and head back for a beer. 30 minutes later still no sight of the mine or the road when we run across another group of 4 wheelers coming our way. We ask them about the mine or the mine road and they say that there is nothing out there but desert but they are headed back to town. So we turn around and follow them. Well we were within ½ mile of the mine and zigged when we should have zagged after taking the next right. Moral of the story bring a map or GPS when out in the desert! That night we went to Heaven’s Kitchen BBQ for ribs! We had been there last year when he visited and that was the one request he had when he was here. It did not disappoint! Those of you who know us know we like it really cold in our house. Always have and it is not uncommon for us to see our breath in the morning when we get out of bed. When we lived in a house we always turned the heat up to “company heat” whenever someone came over. But we would not need to do that for our tough guy buddy Kevin right? But even so, we turned the heat up to 50 and just to make sure he did not get cold we gave him two blankets. After inflating the bed and tucking him in we retreated to our bedroom, closed the door opened two windows and went to bed. During the night we heard the furnace kick on twice so we figured Kevin was nice and toasty in his bed. Imagine our surprise when we woke up the next morning with him wearing everything he brought on standing over the heat register with a blanket around him shivering like he was freezing! He later told us that his house is usually set between 70 and 75 and he likes it really warm! Well, that is one way to insure he was not going to spend another night! The next day after going to Grub Stake for lunch we went back to rig to have a few beers and fly the drone. Kevin had never flown a drone before and actually flew it further away from the rig than I ever have flying it over 5,000 feet away……straight to the clothing optional section! Luckily it was a cooler afternoon so there were not anyone wandering around outside but even still….my apologies to the good folks over there, sometime you just cannot control your friends! Kevin flying the drone over the clothing optional section! Yesterday we had a lunch date with our friends Dale and Ruth who had recently returned from a trip to Cancun. And bonus…. It was my birthday! Ruth prepared a great meal of tri-tip tacos, those combined with a few beverages and great conversation made for a great afternoon! Unfortunately it started raining so we had to cut it a little short. Then to top it off we got a flat tire driving the mile and a ½ back from their place. Luckily it was one of the rear duallys and we limped it home on the one good tire rather than change it in the rain and mud. What cat do you know that has her own chair? Barb showered me with gifts; a hat, a shirt, a new tackle box and a new reel case so I spent the rest of the afternoon playing with my new tackle box moving items from one the old box to the new one. The evening was topped off with a great dinner of king crab legs and lobster! There are pros and cons to having your birthday so close to Christmas. The con is that growing up you constantly hear “this is a combo Christmas/birthday present” but on the positive side some of my favorite foods are on sale as it is the day before New Year’s Eve! We were able to pick up some king crab at $14/lb and a couple of small lobster tails for $4 each which Barb cooked in her new Instant Pot….totally delicious! Tomorrow is the start of the new year ending one of the most adventurous years of our lives. I cannot even start to tell you what the highlights were, there were just too many. Our Alaska trip was absolutely incredible, the fishing, the scenery and the new friends we met along the way. Looking at our Travel Map, we started our year and ended our year here in Quartzsite. As a matter of fact we are within a couple hundred yards of where we parked last year. It has been a great year filled with memories and friendships that will probably last a lifetime…..
Bring on 2017 and let the adventure continue! The girls found another geocache! What a difference a week can make! This is going to sound weak to many but it went from highs in the mid 70’s with lows in the 50’s to windy with highs in the 50’s and lows in the upper 20’s/low 30’s. It is interesting to see the diversity of how people dress around here and you can certainly tell where people come from. You see everything from people in down coats, hats and gloves to people in shorts and t-shirts all out and about at the same time! Aside from our normal water, waste water, line dancing (Barb) and laundry routine, we had a quiet week. With the weather being like it was we stayed inside much of the time. I did manage to repair the blue boy with some JB Weld, hopefully we won’t have any more leaks. Between the rain, wind and dust storms the rig got a nice layer of dirt on it but with the help of the California Duster we bought last year it was back shiny in no time. This worked out well as she wanted to go to Phoenix to do some Christmas shopping anyway. So 5am Tuesday morning they were off to Phoenix. I don’t know all where she went but I did see a Cabela’s bag in the truck when she returned! She also had a liquor box full of booze from TotalWine and More. Although the liquor prices in Parker and Quartzsite are not horrible a bottle of Apothic wine was 6.97 at Total Wine, $2 cheaper than around here and a 1.75 bottle of Captain Morgan was $4 cheaper at 19.99. Dakota was traumatized and sore but is now quietly recovering here in the rig. We just have to keep her quiet for 7-10 days and the stiches dissolve. Speaking of Dakota, we finally came up with a middle name for her! We were looking for something that was a natural, like…Daisy Mae. It came to us by “accident” but it is the perfect middle name for her. She is such a clumsy klutz. The other day while standing by the front door she got startled, jumped up the stairs and slammed into the door again tumbling over backwards. Barb said, “Good thing we did not name her Grace” It was at that moment we knew we had the perfect middle name for her! What is There to do in Quartzsite? One of the most frequent complaints about spending the winter in the desert outside of Quartzsite is that there is nothing to do other than to sit out in the desert and watch that days go by. And there are days we are happy just doing that. There is nothing wrong with the occasional day of just sitting in your lawn chair reading a book and taking the dogs for the occasional walk. That said, there is plenty to do in the area! If you are into geocaching there are literally thousands of caches in the area. There are both strings of caches as well as more scattered single caches everywhere. If you get on a string, it is nothing to hit 15 or more caches in an hour. We typically take our 4 wheeler when geocaching as it makes all but the most remote caches accessible it is also much quicker when traveling the rougher desert roads. No 4 wheeler? No problem, there are still thousands of caches at are accessible by Jeep, truck or even a car. Speaking of 4 wheelers there is always the 4 wheeler adventures back into the hills to explore abandoned mines, vistas and other attractions. Since we got our new tires we have been on several rides and although Dakota is not running to the 4 wheeler wanting to go for a ride, she is not running the other way either. 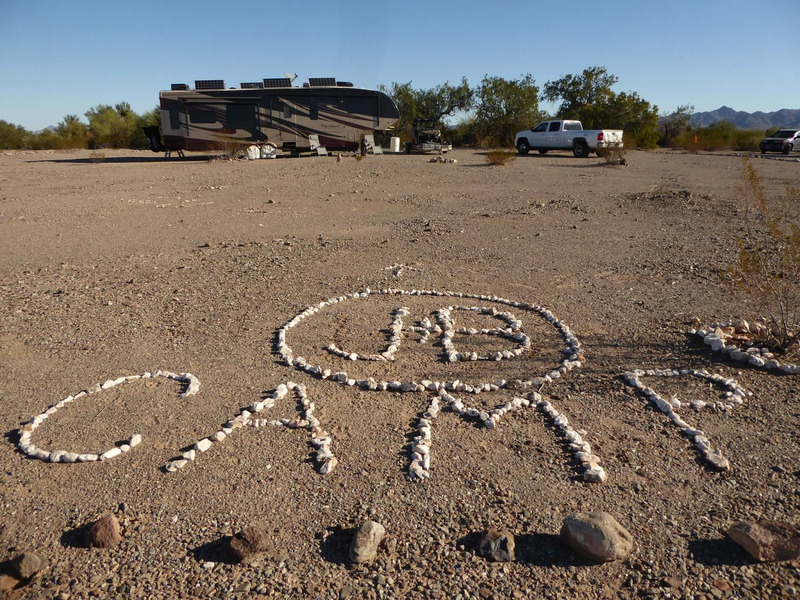 You never know what you will run across in the desert....a pet cemetery! Hiking trails abound everywhere, we have not hit the trails yet this year but we did get our share in last year. I am sure it won’t be long before we hit the Palms Canyon hike that we did several times last year! If exploring the desert is not your thing, there are plenty of things to do in town. It seems like there is something to do every day of the week and even more on the weekends. The QIA Activity Center has something going on all the time. Spanish classes, line dancing, exercise classes and of course the ever popular bingo just to name a few. Barb has been going to line dancing classes the past two Wednesday for 2 hours, She said the classes are a lot of fun with about 30 participants. There are several levels from beginning to level 4. Right now she is going to beginner but is considering level 2. If none of that excites you there is also plenty to do and see with just a short drive. Yuma, Parker and Lake Havasu and even Algodones Mexico are all within 90 minutes. We spent a day in Parker this week running errands; grocery shopping, hitting the ATV and automotive store and even a movie. ($6 on Tuesdays). We saw Office Christmas Party as we were in the mood for comedy. We had low expectation but this movie was actually hilarious and it was not crowded at all. Something that I am sure will change as the season progresses. We are making good progress on our project list crossing off the tires on the 4 wheeler, brakes on the jeep, the detailing outside of the truck and completing the wax job on the rig. It seems like every time we complete one item on the list we add two. Waxing requires you to touch every square inch of the rig which led to more projects; while waxing the skirting on the passenger side I noticed a pencil sized hole in the aluminum skirting. Upon closer inspection I saw that there was a piece of angle iron coming off the frame that was touching the aluminum and eventually rubbed a hole through it. It was very tight under there and the only way to get to it was to use a hacksaw blade with my hands and cut 1/8” off the corner of the angle iron so it was no longer touching the aluminum. Next step figure out how to fix the hole.....Very bad design! Add on project #2…..The front of the rig nearest the ground really takes a beating from rocks and gravel. Last year I replaced the rubber edging and painted it with Flex Seal, well much of the paint had come off the rubber edging so I taped it off and gave it another coat. #3…..Then while changing the brakes in the Jeep one of the lug bolts had some thread damage and broke when trying to force the lug nut over it. This required me to take the rotor off to get the broken lug bolt out and wouldn’t you know the axle nut was froze too so I had to go buy a 36mm socket and a breaker bar but we eventually got it done. But our most memorable event of the week occurred when I emptying our sewage into our Blue Boy. Until our friends Red and Pam get here with their macerator pump we either have to hook the rig and drive it over to the dump station or we have to use our Blue Boy and take it to the dump station 42 gallons at a time. Before I go any further, I know many of you are hoping that this story ends with me covered in poo, I am sorry to say I remained poo free. Everything was going well, I got the Blue Boy filled to capacity hooked it up to the 4 wheeler and started the slow trek to the dump station. As I was driving along I would glance back to make sure everything was going well until one time I looked back and saw a wet line behind the Blue Boy I stopped to look and saw a pea size hole (pun intended) in the hose and was leaking as I went down the road. We saw a couple of Blue Boy catastrophes last year and evidently it was my turn. Well at least I did not lose the whole load in the middle of the road like one guy last year! I jumped back on the 4 wheeler and beat feet to the dump station with a trail of pee following me. Guess, I have another new project! Temps in Douglas, North Dakota this week! We have been watching the crazy weather across the country and are glad we are camped out in this warm little corner of Arizona as opposed to our farm friends in North Dakota! So as you can see there is plenty to do in the area and we did not even get into the Big Event and all the Jeeping trails. But even with all that if you find yourself getting bored look us up, I bet there is a project that you can help with! For the first time since we left the Dakotas we had an adventure that did not involve snow! After leaving Death Valley we headed south to Mojave National Preserve. It wasn’t any warmer down there with lows below freezing and winds that made it feel even colder. We spent a day there exploring in the Jeep but did not get out on any hikes. Tired of the cold and the high prices in California we decided to head to Quartzsite a few weeks early for some warmer weather and low cost living. Besides we had a huge list of projects that we wanted to get started on. What project list you ask? One that we have been adding to for the last several months, we thought we would get a few hammered out while we were in North Dakota but we kept too busy! It felt good to pull into La Posa South knowing we were going to be parked for an extended period of time. This is our second year here in the desert and unlike last year, this time we knew what we were doing and the general area we wanted to be. 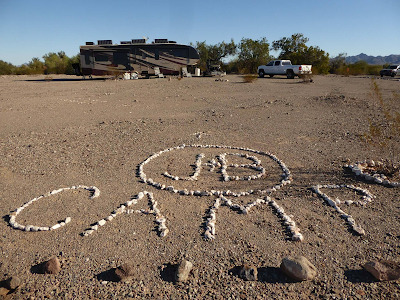 For those of you who are new to this and interested in desert life you should check out our Beginners Guide to Quartzsite and Week 1 in Quartzsite blog posts we did last year on some of the basics about living in the LTVA and life within the town of Quartzsite. After paying our $180 seasonal fee we headed in. We were hoping to get the same spot that we were in last year and arriving this early we felt confident that we no one would be in it. Wrong. As a matter of fact almost every spot in our little “Dreamers” section from last year was taken. Time to find a new spot. We drove around a little bit and spotted a site right along a wash that would work. The nice thing about being on the wash is that no one can park behind you so you have a bit more privacy. After setting up it was dinner time and neither of us wanted to cook so we went to The Grub Stake for their Friday fish dinner. Walking into Grub Stake we were reminded of one of the things we liked about being in Quartzsite. It makes us feel young! We were easily the youngest people in there by 10 years. I was surprised they did not card us! The fish dinner was very good with huge portions, we would highly recommend it. The following morning we completed our set up. Barb did some fine tuning on the rock border and changed the initials on the yard sign one of the previous occupants had constructed while I tilted the solar panels, set up tables, chairs and got the place homey. Our next order of business was to buy a new mat for the front of the rig. We had been wanting one for quite a while but kept putting it off. To force ourselves into action we donated our old one to Chris and Holly at the farm in North Dakota. We returned home the proud owners of a new 9x18 mat ($65) and now were ready to relax! With cocktails and books in hand we settled into our chairs on our new mat and read for exactly 10 minutes before we decided it was too hot outside and retreated inside the rig. What a contrast to what we had been experiencing the last few weeks! It has now been a week since we arrived and I am happy to report that not only have we gotten a start on our project list we have even gotten out on a couple adventures! Don't tell Barb I borrowed her toothbrush! Barb also put up our stickers from our summer travels. We started collecting stickers last spring after we saw Dino and Lisa had a collection in their rig and thought it was a cool idea. Since then we have been collecting stickers from each of the significant locations along our journey. Wished we would have started this from the beginning! Barb decorated the Christmas tree we picked up at Home Depot, set up our solar lights under the awning, set up our “yard” lights and completed a deep cleaning in the rig. Not much sitting around and relaxing yet but we are making progress! We have gotten out on two adventures, well really one mini adventure and one real adventure. The mini adventure included attending the Quartzsite Craft/Garage Sale at the QIA Community Center where vendors set up tables to sell their crafts. 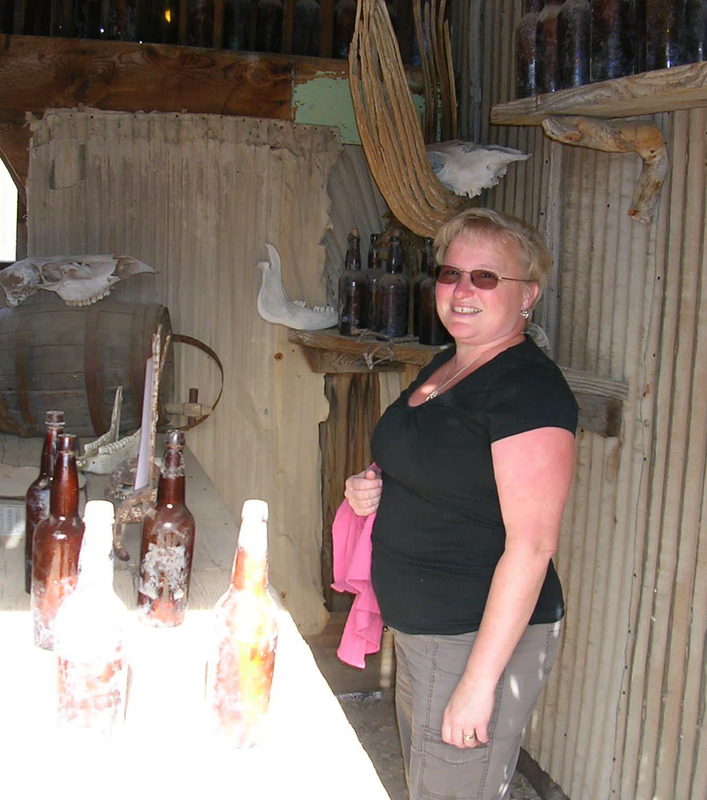 There is everything from doilies, handmade knives, wind chimes made out of beer cans and lots and lots of handmade jewelry. The garage sale portion consisted of what looked like to us a bunch of junk that no one would ever want. We walked each of the aisles looking at all the wares but in the end did not find anything we could not live without. Our big adventure included fellow Dreamers and FT RV’ers Dale and Ruth are in the area. 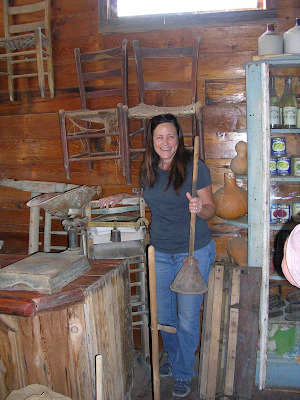 We got together with them and visited Castle Dome Museum about 50 miles south of Quartzsite. Several of our friends had visited this last year and it was on our list of “must do’s” this year. The museum is privately owned and is a 1880’s mining town consisting of buildings in their original location and other buildings from that era that have been moved into the town. It was very interesting to see how the townspeople lived back then, the clothes they wore and tools they used. I was noticing how small the women’s shoes and clothing were and Ruth who worked in a museum at one point in her life informed me that the average height of women back then was less than 5 feet. Weird how we have evolved so much in 100 or so years, makes you wonder what the next 100 years will bring! Dale sneaking out of the brothel! Barb said she wanted a washer/drier combo for Christmas! Not much has changed in the past 100 or so years. The town had one church, one bank, one post office and 5 bars. Reminds us of rural Wisconsin! We are continuing to work with Dakota. Although she is much more comfortable with both us and other strangers, other aspects of her training have stalled. As she has become more comfortable, she is also becoming more stubborn. We have been working on loud noises and riding in the 4 wheeler, neither of which she likes at the moment. She has developed two tactics in response to these. One we call the ostrich where she will bury her head in your arm or a pillow when she is scared and pretend nothing “bad” is going on around her. The other is to totally ignore you when you call her and walk to the other side of the trailer where you cannot see her. There she will sit and hope you will just go away. Although both of these are somewhat cute we cannot let her get away with them and coax her into continuing her training session on a good note. It is still early in the season but it seems more crowded than it did last year. The big show is still over a month away, looks like it is going to be a busy season!